Johannesburg - Mountain biking fans from around the country will converge on Northern Farm outside Fourways for the seventh edition of one of the most unique races on the calendar, the Believe MTB Race and an important fundraiser for The Cows and their ongoing drive to support the Childhood Cancer Foundation CHOC. The Believe MTB Race set a new record for entries for a debut event when it was launched in 2009 by Marc and Charlie Bainbridge when it attracted over 1400 riders, and has matched this level of support every year since then, thanks mainly due to the heavy emphasis on fun. Riders have traditionally been presented with a glass at the finish instead of a medal, often accompanied by a celebratory ‘shot’, reflecting the antics that are typical at the shooters table stationed at the water tables on the route. Dress-up is almost mandatory, and the day’s most prestigious award is the Mad Mulley’s Award for the best dressed person. Seven years on, the Believe MTB Race has grown into something of a Gauteng institution, and even though the Bainbridges have moved to Mbombela, the race will continue in it’s zany format. Marc and Charlie Bainbridge joined The Choc Cows in 2008, and after creating the Believe MTB race as their way of creating funds for the cause, Marc joined the Cows committee in 2010 to further assist wherever possible. “Marc’s brother Craig came back from Dubai after he was diagnosed with cancer, and we started fundraising for his treatment with Marc riding to Cape Town. We then decided we would start our own annual fundraiser for The Cows, and decided to do a totally different mountain bike race. Craig always had the word ‘Believe” tattooed across his chest, as a mantra he lived by, which is where we got the name for the mountain bike race,” she added. “The Cows do things totally differently, so we set out to put together a race that was based heavily on fun. 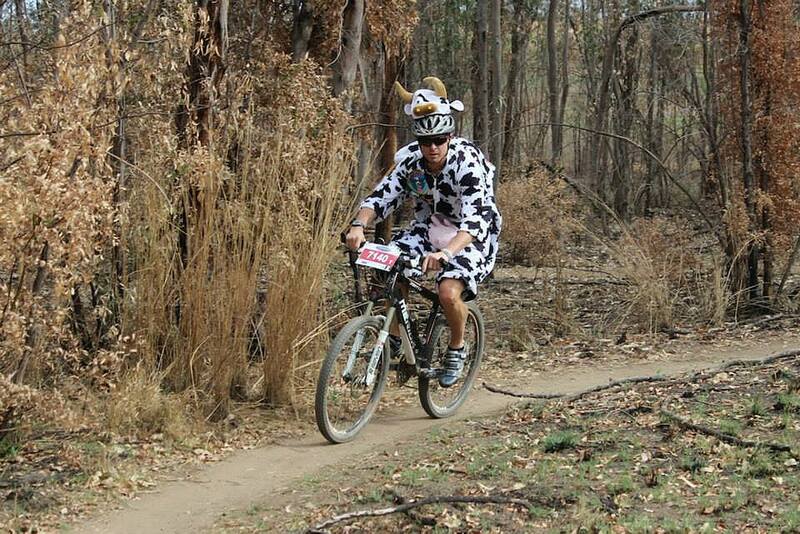 We encourage riders to come dressed up, but The Cows need very little encouraging to do that anyhow! “The shooter tables have become pretty legendary as well, and while we always get a number of the top elite riders coming to do the race every year, they understand that there is no big cheque for them at the end because this is all about raising money for The Cows. She says that having to relinquish control of the race when they moved east was difficult. “It has been an act of family labour for the last six years, “ says Bainbridge. “I am a control freak, so offloading the race was really hard. We had a big say in how we wanted the race to be run going forward, to make sure the ethos remains the same. By bringing in the right partner in Richard Beswick and Illumin8, riders will be guaranteed an even better race going forward” she added. The event on 30 September will once again offer skilled riders a testing 55km course with technical demands and flowing single track, while the 25km and 10km races are far easier and less technically demanding. “We really want everyone to get involved, so there is also a 1km ‘race’ to get the little ones in on the action as well,” she said.